Today marked the 40 page mark in the alpha write-up of Innsfjord. I now have a complete non-outlined version of the town, the wilderness around it, and the Temple crypts done. So I pressed on, hoping to knock out a little of the town jail and maybe start re-planning the "Forgotten Temple" dungeon. A little background first. When I am designing a dungeon the first thing I do is make a note on what I want that dungeon to represent in the story. That is how does the dungeon ("optional" or not) move the story ahead or allow the player to gain some more insight on the story as a whole. In the crypts this was done in two ways. Lore being the first, the players get to learn a lot about the town, the founding the movers and shakers and about some of the town's dark past. The second is in certain kinds of items that can only be found in the crypt that may help the players out later and make things easier (like say the key to the light house's front door). After I figure out how the dungeon is involved in the story (and whether I will keep it in or ditch it), the next thing to do is map the dungeon. Trust me, I will not be the final mapper for Innsfjord. I don't have one yet, but I will hire someone to do the maps for me (and hopefully be able to afford it). After I've finished mapping the dungeon the next thing I do ist sync the story bits I want in the dungeon with the dungeon itself. 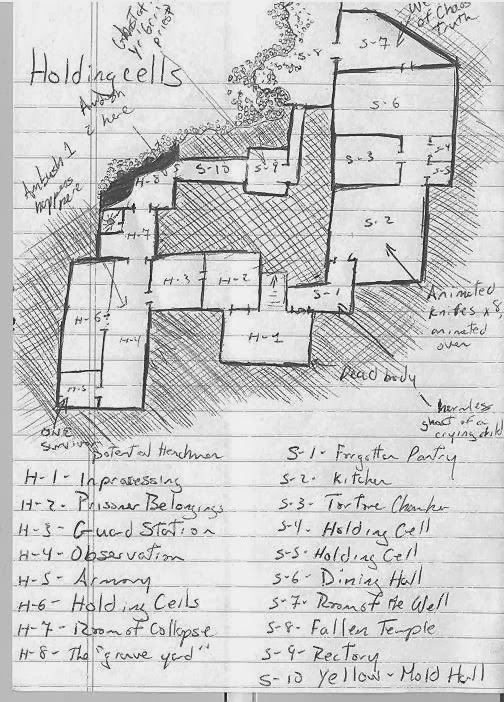 This is typiclly done with copious notes arrowed into my sketch of the dungeon. Why was the jail introduced into the story? Honestly, around the time I was expanding Innsfjord to a full on adventure from its 5-minute adventure roots I was watching Solomon Kane on netflix and was rather in love with the scene under the church when Kane is "fed" to a crazed priest's zombie flock. The dungeon is more event than adventure, but given that it is a small part in a longer adventure I think and hope that the players will enjoy it. now to see if there are any mob rules for OSR.